“-Re” House together with “-Re” Adapt are two series part of a project in which I review, refine and redesign residential projects available on the Dutch housing market. “-Re” House touches projects that have been completed after the year 2000 and could have been done more effectively to begin with, while “-Re” Adapt looks at older residential architecture that was designed in a different cultural and historical context. More than often I see bedrooms getting their square meters based on a certain scale of importance. The master bedroom is always the largest, which should be no surprise as it caters to the needs of two people. The secondary bedroom is typically designed to house one person, and it is usually known as the child’s bedroom. Which brings us to the third bedroom, the leftovers room. This is the space that can house either a small office or a cramped nursery. But what is one to do if there are two children of close age? Move in search of a larger home, one with a better division or toss a coin and see which child loses and takes the smaller bedroom? • I think the issue that troubled me the most here was that certain functions are cramped in order to allow others to occupy as much space as possible. The sacrifices that have been made in order to achieve a large living room, a big master bedroom and a wide space wasting hallway on the first floor. 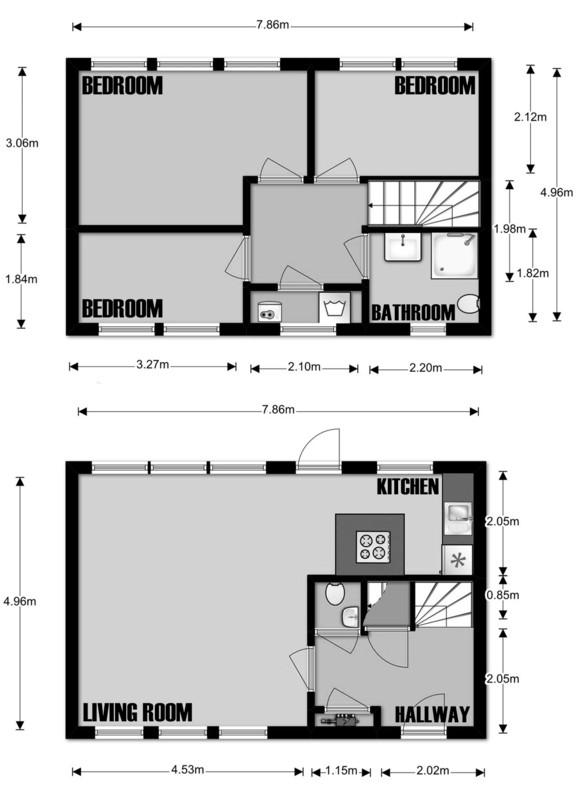 • There are 80m² available, yet the kitchen is cramped in a corner. Out of sight out of mind. The kitchen is the core of the family home. The same way the fire pit is the core of a camp, the kitchen is the social and functional heart of a home. In the morning we meet in the kitchen, at lunch we meet in restaurants, cafe’s and cafeterias, and in the evening we regroup to cook together. So why would I want to do that in a cramped room when space isn’t an issue? • The door to the garden eats out of the kitchen space and forces a circulation path from the entry door through the living room that doesn’t do any favors to the space. • Upstairs the bathroom has been shoved into a corner to make space for a large square hallway that doesn’t bring any extra benefits. • The master bedroom has been, as usual, favored and provided with the largest surface on the floor. True, the master bedroom houses two people so they require more space, however that doesn’t mean that we shouldn’t give the same care to the rest of the rooms/bedrooms. OK, so what did I do? • I didn’t like the original entry way. Though it was effective and it is a commonly used design, I felt a different option would be better suited. I wanted the possibility to reach the kitchen without having to go through the living room. I also wanted a more fluid layout, a more relaxed one if you will. As a result I have created a partially open distribution point. All important spaces can be easily reached from the hallway, without having to go through another space. Well, with the exception of the garden, but it’s survivable. I’m sure of that. • In this version I have allowed for a large kitchen space with a bar like table that can be used as a breakfast nook but also as a working space out of the living room activity. However, if desired, the table can be moved towards the right and allow for a larger living room space. The spaces of a design vary based on the needs and priorities of its residents. 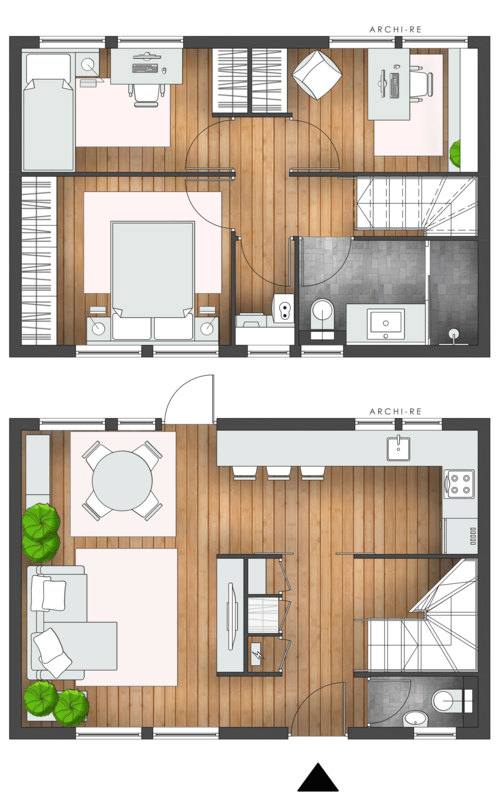 What would you use more of: living room space or kitchen + dining space?